My Squeeze (for Babies and Toddlers): Eat Me, Drink Me, Squeeze Me! Re-usable silicone food pouch - an eco-friendly food storage pouch. Perfect for children aged 6 months and up, My Squeeze is suitable for just about any home-made baby food or drink you can think of. It can be frozen or microwaved warm, is dishwasher safe and easy to use. Save money by bringing your own food when you are out and about; My Squeeze is an awesome rubbish free alternative to single use disposable options. Simply fill the BPA free silicone base with your choice of food or drink - yoghurt, custard, pureed fruit, jelly, soup, smoothies and any other kind of baby food, and pop into the fridge or freezer. If you microwave the contents warm, just be certain to test the heat of the contents before giving it to your little one, because of the risk of possible 'hot-spots'. 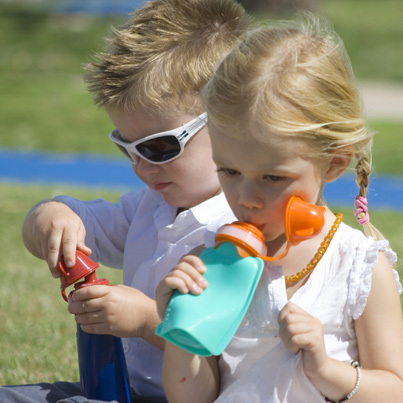 My Squeeze is the eco friendly, reusable food pouch designed for Babies and Toddlers. It is available in three fun and vibrant colour combinations. Drink me, eat me, heat me, freeze me, squeeze me! To fill: Just fill via the top opening with a spoon, pitcher, or funnel. Fill only to 3/4 full; especially if you plan to freeze the contents (this will cause them to expand). To clean: Wash the pouch in about 20 seconds with warm, soapy water and a bottle brush, or place on the top shelf of your dishwasher. To dry, open the pouch and place a whisk, spatula, or large spoon inside, and pop it in a glass on the bench or window sill. Features: The cap is impossible to lose as it is fastened to the base, and the 'ears' always align with the sides of the pouch. The silicone base is self-supporting and has no corners, so it is easy to clean. My Squeeze has a 32mm opening throat for filling with a spoon, and a large mouthpiece opening. Certifications: Achieved second place in the World Environment Day Awards 2014 in its category 'Sustainable Product Design'; Listed in the Anthill Top 100 2014 which is Australia's biggest awards for innovation.